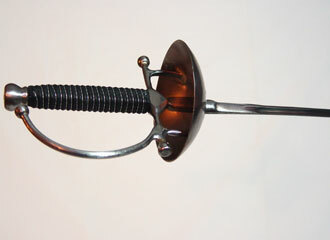 Late Italian rapier is sometimes erroneously thought of as an “Italian small-sword”. The small-sword is properly a French weapon; in contemporary Italy the weapon used was a cup-hilt rapier of reduced size as compared to those used in earlier periods, still termed, simply, the spada. The Italian spada was used well into the nineteenth century. The development of this weapon and the manner of its use reflects an evolution of the systems of the 17th century rapier suited to this particular weapon and its social-cultural environment. The instruction is based on the teachings of Rasaroll Scorza & Pietro Grisetti (1803). Instruction in Italian rapier includes single rapier, rapier & dagger, and rapier & cloak.